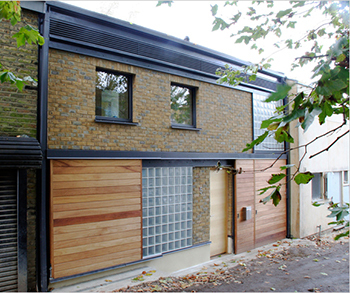 The Architect Richard Dudzicki Associates (RDA) collaborates with the Centre for Architecture and Sustainable Environment (CASE) at the University of Kent in a two year post-occupancy study of a PassivHaus certified property in Camberwell, London. No. 5 Stories Mews is designed as a flexible 3-bedroom house with an artist studio. The study is conducted by MSc and PhD students under the supervision of Dr. Henrik Schoenefeldt. A three-month pilot of the monitoring was started in mid-February 2014 with the aim of gathering some initial data on air quality, indoor climate, energy consumption and user satisfaction. The objective of this post-occupancy study is to develop a comprehensive understanding of energy consumption, the indoor climate and air quality and how these are affected by changes in user-behaviour, weather and interior activities. The study covers three main areas, which are (a) energy consumptions, (b) occupant behaviour and satisfaction and (c) indoor climate and air quality. It is based on a methodology developed by Dr. Schoenefeldt as part of his research at the Universities of Cambridge and Kent, which integrates quantitative, qualitative as well as participatory research methods. These include environmental monitoring, electricity metering, interviews, questionnaire-based survey and focus groups. The project has been shortlisted for this year’s green build awards and an outline of this post-occupancy, produced by Dr. Schoenefeldt, has been included in the submission: http://www.greenbuildawards.co.uk/. Stories Mews will be used to test and refine this methodology, which is to provide a model for the post-occupancy evaluation of RDA’s forthcoming PassivHaus projects.